During my 1st quarter review of my blog I discussed how I’ve heard a lot about how branding for your blog/business is so important. The issue that I struggled with was turning it (the blog) into a “flourishing” (profitable) side hustle and keeping it strictly fun and helping like minded women – staying true to who I am. Long story short – I can do it all and it can be done effortless. I came to this conclusion after spending a Saturday sitting in the middle of my bed with no tv on – just music (SZA’s Ctrl Album to be specific) and candles burning, working on my Brand Beginnings 101 Werkbook, that the talented marketing genius Courtney Brand, created. If you follow me on IG then you saw my post on how I stumbled across The B Werd, early last year after it was launched and this was a major motivator in me revamping and relaunching my blog. After I completed this werkbook, I was more than motivated to continue to take ForeverShauni to the next level, plus it also gave me the inspiration and courage to start the process on my next Side Hustle (you can never have to many streams of income). I’ve always known the “why” behind me starting the blog, but it’s more defined and aligned with the how and what. This helps create a strong mission statement and also help align with the ultimate vision of your product. Not to give away what all the werkbook contains, but the competitive edge helped me identify how I actually stacked up compared to my “competition” (I use the term competition loosely) based on the feedback that I’ve received from friends and followers. I must say after looking at it written down, I stressed myself out over NOTHING. The “What makes me different?” section also gave me a lot of sass – because I am different – the only thing we have in common is the fact that we are in the same playing field – but I’m always willing to help and support my fellow bloggers. Defining my target audience has helped me understand the direction of the material/product needs to be created. You have to understand what they believe in, what they need and how you can reach them. It’s almost as if you are walking in their shoes so they can relate and continuously come back for more. I’ve always known consistency is key when it comes to blogging and really anything that you are doing. The werkbook gave insight on a seamless brand – from the logo to the content to the personality that will attract your target audience. For me when I decided to relaunch, I googled and pinterest everything that I could. New blogger or even established ones, I encourage doing your research, but I also recommend this workbook. The topics discussed truly helps get the ideas out of your head and onto paper and it is an actual plan of action. 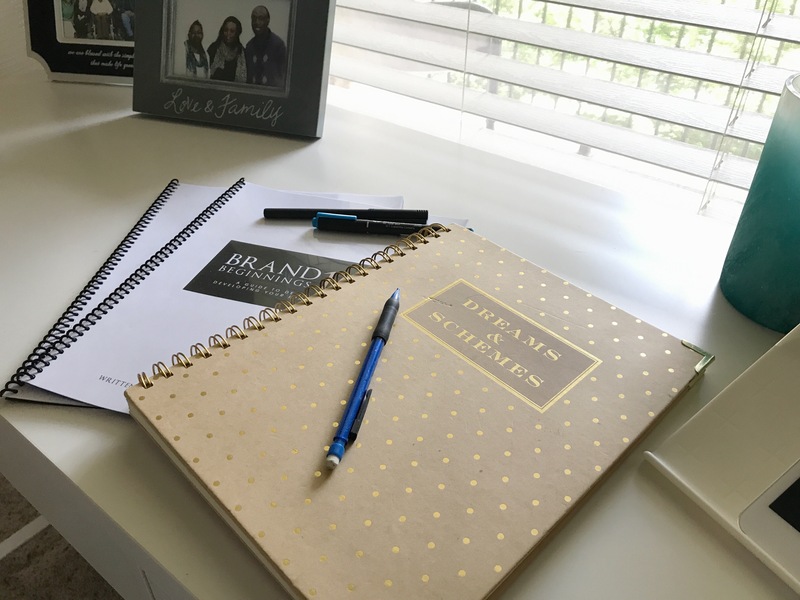 Before spending tons of money, getting the experts to help, pick this inexpensive, but valuable workbook to the initial steps of getting your brand up and running. I could write on and on about how each section gives you a whole new perspective, but I’ll let you experience that joy on your own.